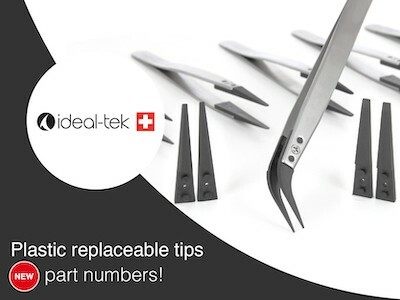 Ideal-tek is expanding the range of replaceable cost-effective tip tweezers. Our unsurpassed experience and knowledge of these high-performance materials allows us to deliver application specific solutions for our customers most sensitive and critical applications. For detailed information on how to select the best Ideal-tek replaceable tip tweezer for your application, please see Synoptic plastic table and Chemical compatibility chart. Click Plastic Replaceable Tip Tweezers page for our complete range of application specific, high precision replaceable tip tweezer solutions and watch the tutorial video How to change replaceable tips.